I've done various kinds of crafts since I was a kid. I sew. I do photography. I do linoleum block prints. I do flower arranging. I cook and can. I make all sorts of fun stuff for Christmas presents each year and that allows me to explore all sorts of new things. I've made Valentines to send to friends and family each year since 1973. I've sewed since Junior High, making most of my clothes through graduate school. 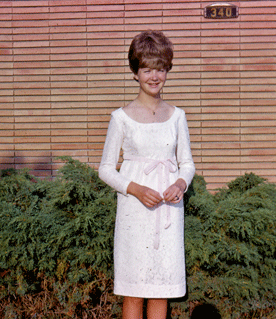 I made this dress for Junior High Graduation. When fabric got more expensive than the clothes you could buy in the stores I gave it up and started making gifts like stuffed animals and dolls, travel bags and jewelry boxes. Aside from the photo of the bears above I haven't documented any of them. A couple of years ago I started making quilts as gifts for my sister, Kathy. I view my crafting as a creative outlet and a wonderful break from things like gardening and web-mastering. I loved to take the fruits of my labors in my garden and be able to cook, can, do flower arrangements and make gifts from them. I also love to take photographs of my garden and of our travels and then make gifts from them like greeting cards, magnets, decoupage boxes and calendars. The crafting has mostly been put on hold while we travel in the Airstream but the photography still happens big time. Copyright Winterhaven Press 2008-9 All rights reserved.